Our clothing is a huge financial investment so it is important to make it last as long as possible. So what is better, washing at home or dry cleaning? It all depends on the fabric used for the clothes and how the garment is made. Typically, more expensive fabrics and styles do require dry cleaning. Dry cleaning costs can add up so you want to get the best results possible. Part of the responsibility lies with you, following these tips will get you the most for your money. Mom and Pop dry cleaners have nearly disappeared from most towns as larger, national chains have taken over. Even those stores that are still locally-owned often have several locations. Many of the locations are manned by an hourly employee who has no real knowledge of the dry cleaning process. He or she simply processes the incoming and outgoing laundry to head to a central cleaning facility. For the best service, go to the flagship or home store location of the dry cleaner. You are much more likely to get personalized service and be able to speak to someone directly involved in the cleaning process who can address special stains and problems. Dry-cleaning is an overall process using chemicals to remove general grime and odor from clothing but may not work on specific stains. Professional cleaners do have specific chemicals and methods to tackle different types of stains from oil to blood to dye transfer. However, don't assume that the dry cleaner will find all the stains. If your clothes have stains, always point them out in advance and tell the cleaner what they is, if you know. Giving a heads-up will help your cleaner do a better job. What About The Buttons And Bows? If you have a garment that features special buttons or embellishments, more care should be taken when having the garment professionally cleaned. Some cleaning solvents can cause metallic buttons and trim to tarnish permanently and some plastics can even melt. Buttons made of wood or bone or delicate decorative buttons made from mother-of-pearl or faux gemstones must be protected from dry cleaning solvents. Some dry cleaners will remove delicate buttons or at least cover them with foil during cleaning. Ask questions! You may get the best results by removing buttons and embellishments like fabric flowers yourself before cleaning and sewing them back on later. Perhaps there's a spill on a suit coat but the skirt is still clean. In an attempt to save money, we sometimes take in only one piece of a suit or outfit. That’s not a good idea because the color of items that are dry cleaned more frequently change color in comparison to their matching pieces. 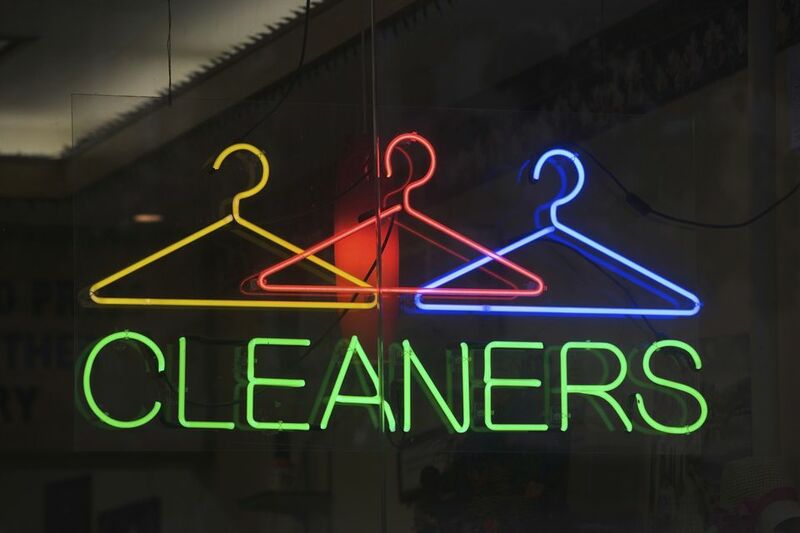 Dry cleaning chemicals can cause fading or even darken dyes. Saving a little bit now may ruin the look of your outfit. We're usually in a hurry and just want to get home on or onto the next errand. However, for best results, always check your garments before you leave the dry cleaning shop to ensure that stains are gone. If the stain is still there, ask the cleaner to try again. You'll get better service (and fewer surprises) than if you wait several days to return the soiled garment. Leaving a pile of clothes in the back seat of the car until you remember to go to the cleaners is not a good idea. Sunlight and heat in a closed car can cause your clothes to fade, set in stains and weaken fabric fibers. The same goes for the bottom of your closet. The longer stains remain on fabrics, the harder they are to remove. Plus stains can attract insects and you may end up with holes where stains once existed. Nearly every dry cleaning bag has a warning to keep it away from children due to choking hazards. There's another reason to get rid of those plastic bags immediately and dispose of them properly. The plastic bags that dry cleaners use are just meant to help you get your garments home dust free. Remove your clean clothes from the bag as soon as you hang them in your closet and dispose of the bag. Do not store your clothing in the bags even for a short time. The bags can cause damage like yellowing or spotting or even trap residual moisture and allow mildew to form. If you want to protect freshly cleaned clothes from dust, use a 100 percent cotton garment bag or a clean bed sheet.